The National Youth Theatre are coming to Derry for the first time and has called for anyone with talent and passion to get involved. The NYT has launched an Auditions Access Fund which will benefit young aspiring actors across the UK in response to the decline of drama provision. 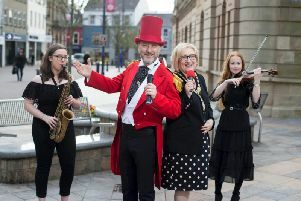 Derry has been chosen as one of 10 areas for the Auditions Access Fund after the NYT investigated areas most in need. The fund is open to budding actors aged between 14 and 25. The NYT will visit Derry between January and March next year to host a workshop on audition technique and on the following day holding auditions. Successful auditionees will become members of the NYT and receive bursaries to travel to London to attend a prestigious NYT summer membership course, following in the footsteps of famous alumni including Hugh Bonneville, Daniel Craig, Helen Mirren, Chiwetel Ejiofor, Zawe Ashton and Matt Smith to name a few. Hugh Bonneville, who is a patron of the NYT, told the ‘Journal’ this is a chance for budding actors from Derry to ‘shine’. The actor, best known for his roles in Notting Hill, Downton Abbey and Paddington, said his experience with the NYT ‘was a really important part of the decision making process about what I was going to do next’. Hugh said that there was a real social mix when he attended the NYT and he met people from all across the UK. “There is a perception access to the arts is out of reach for many. Provision of the arts is diminishing, certainly for anything that is funded through local authorities or government. Hugh said this was a deciding factor in the NYT visiting areas that have had tough economic times so that it is not out of reach, either geographically or financially. “We are aware that Derry has had some tough economic times, like many places across the UK, where people feel I cant do that. “This is a message to the mums and dads of Derry and the brothers and sisters. You know someone who has got that talent and burning passion and feel they are shut out. He said the NYT is not a ‘stars in your eyes’ experience, but is a ‘disciplined and fun way to put on a play’. Hugh said his time with the NYT was extremely important and he is passionate about his role as a patron. “It was so important to me. I had huge opportunities when I was kid because my parents loved the arts. It was part of the diet of my childhood. Hugh has recently finished shooting the movie of Downtown Abbey and is looking forward to it’s release next September. He is also writing and developing other projects tor television. Hugh encouraged anyone who is interested in the NYT workshop and auditions to visit www.nyt.or.g/aaf for more details and for updates on date and venue.